What difficulties are the lead free rhinestones faced with now? What are the solutions to these difficulties? 1.It is still focus on the children products in Euro-American Countries, which could not be used widely. 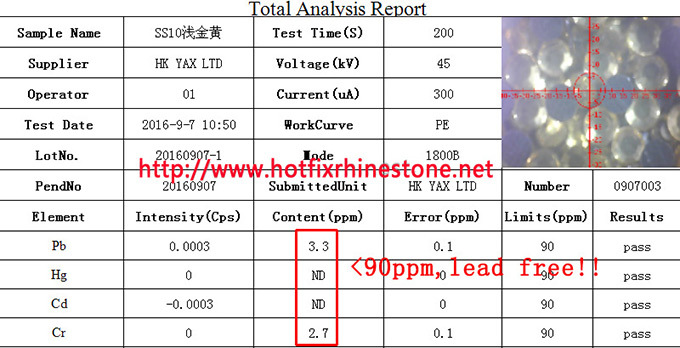 2.The final sellers could not take the control of every single part, they do not have the detailed lead free data for checking, but only tell by their experience. 3.The motif process factories do not take it for seriously, while processing, the not-lead-free material is mixed into the motifs. 4.It is too depending on the third party, and the procedure is too complicated, consuming time and in high cost. 5.The buyers are upset by the unreliable distributors and factories, the broker is annoyed about the lead free test, the garment businessmen are worried about the lead free test by the custom, which will be all solved if we could have the machine to test in every single part!